In this post, homeschool mother and author of Blog, She Wrote, Heather Woodie, shares five science biographies her kids have enjoyed, along with some activities to go along with them. If your kids are like mine, they love to learn about people. In particular, my students love to learn about the people who are responsible for the concepts, topics, and subjects they enjoy. As homeschoolers, we are free to teach in a way that suits our children best and teaching about the people behind the science helps us to make a personal connection to the concept. As a science educator, I find it is much easier to teach science by observation in the home environment and less by conventional means which often lack that personal connection to the scientist that makes it more meaningful. Today I’m sharing five scientists and what you can teach along with each of their biographies. Archimedes is long considered the father of geometry. 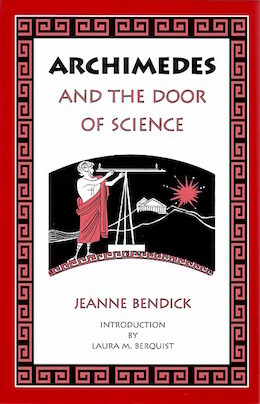 He was a scientist in Ancient Greece who was well known to be a problem solver. We’ve had a lot of fun with these activities, after reading Archimedes and the Door of Science, a lovely biography that introduces many mathematical and scientific discoveries. Chalking Geometry– Have you ever done sidewalk geometry? Archimedes liked to draw in the sand and we can draw on the sidewalk! Mr. Edison was a prolific inventor and scientist from a young age. Your student will be delighted to know that he was homeschooled. I love to read about his inquisitive personality and how he liked to press for answers. 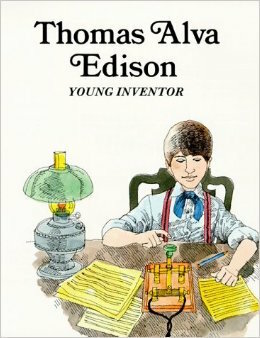 Read Thomas Edison Young Inventor, a Childhood of Famous Americans book on Edison as a boy. Introducing chemistry concepts– As a boy, Edison like to collect chemicals and label them. Talking with Morse code– Tom Edison knew Morse code well and worked for a time as a telegraph operator. Our kids love to use Morse code to communicate. Explaining electricity– He is probably most famous for the invention of the incandescent light bulb, which brought electric lights to the average home. Since we no longer use incandescent bulbs for the standard light bulb, you might learn more about the differences in light bulbs today and how they are more efficient and energy-saving than the incandescent. 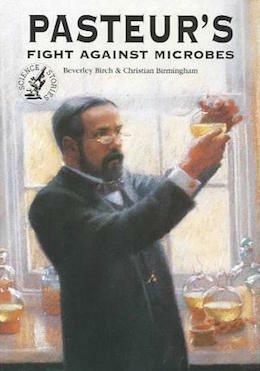 Using Microscopes– The discussion of Pasteur is a great place to begin using a microscope. 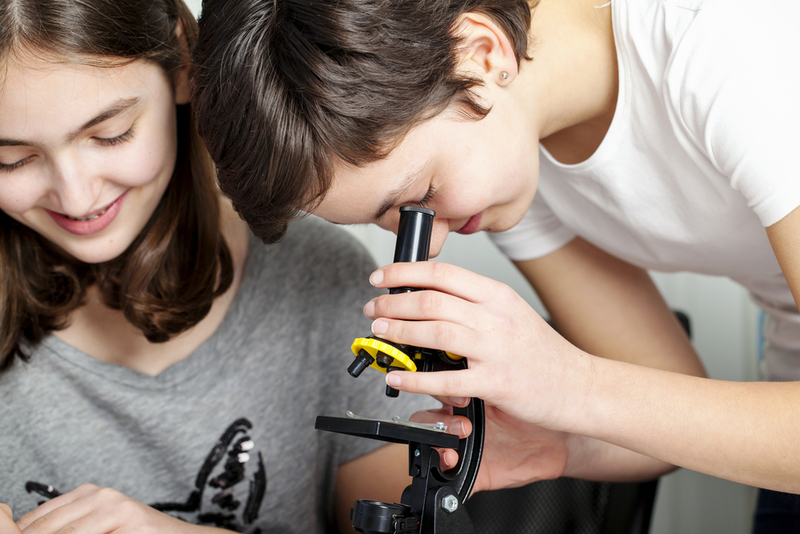 A simple light microscope or a digital microscope will give your student a window into the world of microbes. Growing microbes on a Petri dish– Without washing your hands, smear your fingers across the medium in a Petri dish and wait. Before long, you’ll have growth on the plate and you can see it under the microscope. Then wash your hands well and do another smear. Does soap do its job? How well do you wash your hands? Galileo loved to observe the night sky and your family can too! 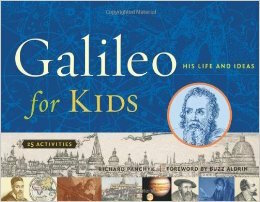 Read Galileo for Kids– a book on the life of this early sky observer with activities to help you learn the science. Testing Telescopes– Even a small telescope will allow you to see the moon “close up”. If you know someone with a telescope or you can head to a nearby observatory, you can see even more. We recently visited a local observatory to see Mercury’s transit across the sun. It is worth the time to be able to look through a large telescope! Star Gazing– Grab a star chart and learn how to read it properly. This includes orienting the chart according to where you are and what time of year it is. Or you can enjoy Google Sky Map which is an app designed to be pointed at the sky and you can see what stars and planets you are seeing. Do you know the difference between a planet and a star when you look at the sky? Planets are brighter, sometimes bigger, and they are a steady light. If it “twinkles,” you are looking at a star. Just imagine what it was like to observe the night sky in Galileo’s time! He didn’t have all the tools we have. Spotting Saturn– Can you see Saturn in the sky this time of the year? Galileo was the first to observe Saturn’s rings in his telescope. Do a simple web search and see if your students can find out what he first saw. 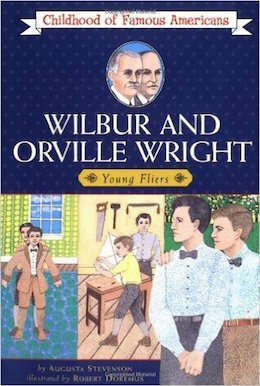 Orville and Wilbur Wright were made famous the day they flew that airplane successfully at Kitty Hawk. Students of all ages, no matter their interest in serious science, love the story of flight. As a teacher, you can take full advantage of this with hands on activities and the book The Wright Brothers Young Fliers. Making Paper Airplanes– We love to build and fly paper airplanes. They are easy to make and can be made quickly to try out and observe principles of flight. Our kids like to experiment with different models and make modifications to see if it improves air time. These are a perfect activity for discussing what makes things fly. The wonderful thing about teaching science along with the people who studied and worked through adversity is that you can customize the experience not only to your student but also to the area of science they like best. Science biographies work well alongside a more conventional science curriculum, too. If you’d like to learn more about how to incorporate this type of science in your homeschool, check out How to Teach Science through the Lives of Scientists on my blog at Blog, She Wrote.